This entry was posted in Electronics, Open Hardware and tagged electronics, octolively, open source. Bookmark the Permalink. 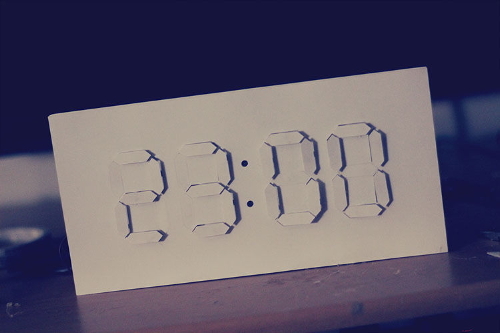 Instructables user alstroemeria has lovingly documented a clock build inspired by the D/A Clock by Alvin Aronson. 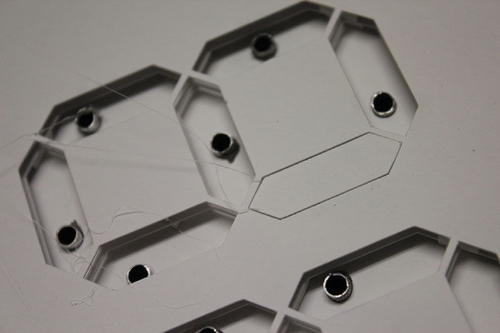 Each of the paper segments is moved in or out by a servo motor to make the mechanical digital display. 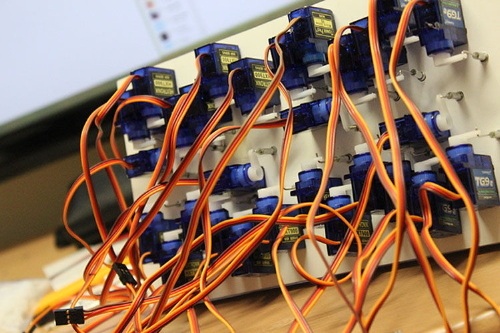 The whole thing is run off of an Arduino with a servo controller board and a clock module. This entry was posted in Art, Electronics and tagged art, clocks, electronics. Bookmark the Permalink. Over at ZeptoBars, they have an incredibly detailed “take-apart” post on what’s inside the ULN2003 seven channel Darlington driver chip. The ULN2003 is commonly used for driving LED displays—you can find it, for example, in our Mignonette game. 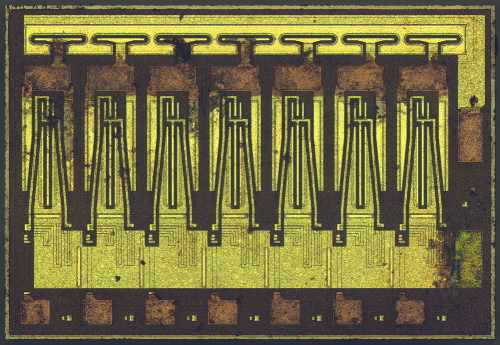 We often receive comments that while out microchip photos are beautiful and interesting, it is completely unclear how integrated circuit implements basic elements and form larger circuit. Of course it is impossible to do a detailed review of an 1’000’000 transistor chip, so we’ve found simpler example: ULN2003 – array of Darlington transistors. They’ve stripped off the outer housing and put it under the microscope. They then analyzed the photos to show you what parts make up the individual transistors, resistors and diodes inside the chip. 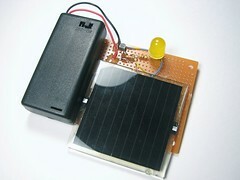 This entry was posted in Electronics, Engineering and tagged electronics. Bookmark the Permalink. 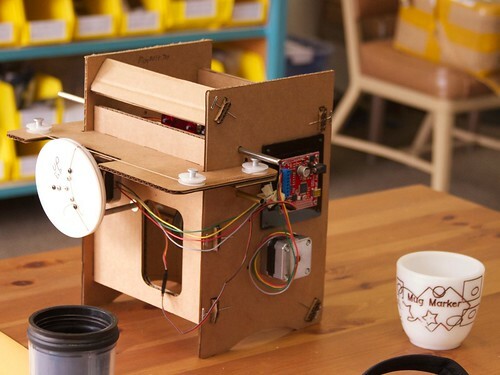 Don McRae recently stopped by our shop last week to show off his homebrew CNC project, the “Mug Marker” — a wonderful little cardboard robot that can draw on mugs. 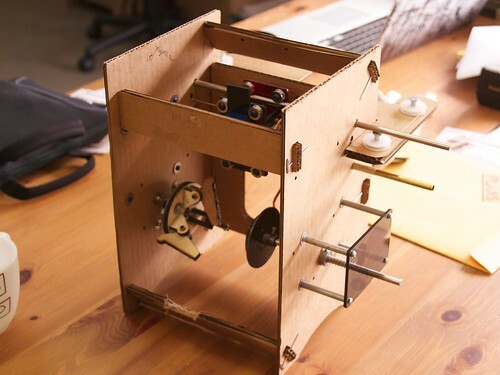 Much like the Mug Plotter on Instructables, it uses the same EBB controller board and stepper motors as the Eggbot, but with linear motion for the pen instead of rotation. 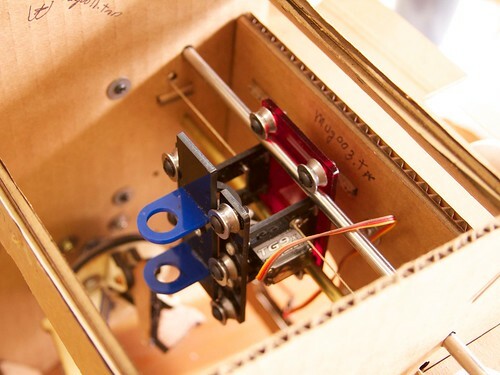 However, unlike that version, Don has incorporated the same winch-drive mechanism that we use on the WaterColorBot to provide motion for the linear axis– meaning that it can go fast or slow, with very good accuracy. The pen holder itself slides into some additional bearings, and has a small protrusion on the back that rests on the servo horn, allowing it to be lifted up or lowered down. 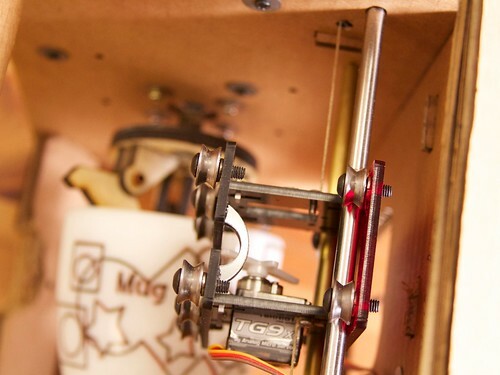 Like the Eggbot’s pen-lift mechanism, this mechanism only (actively) lifts the pen, which means that it can ride over uneven surfaces, or plot on mugs with variable diameter. Underneath the pen carriage, the opening of the mug fits onto a three-jaw coupler on the motor shaft, and the base of the mug is held against a rubber faced spring loaded plunger. Small copper tubes are used as bushings to allow the coupler pieces to rotate inward or outward to allow mugs of differing diameters to fit on. A little silicone on the surface of each of the three parts provides a gripping surface, and the upcurved lip keeps the mug from sliding too far. Looking down through the pen carriage, you can see the mug below held in the coupler. 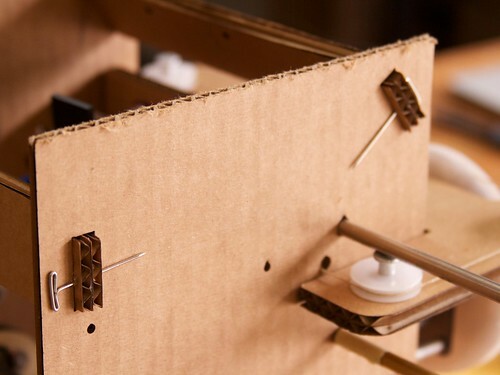 The chassis of the machine is made from cardboard, either hand or laser cut to slot together, and held together very cleverly with pins. 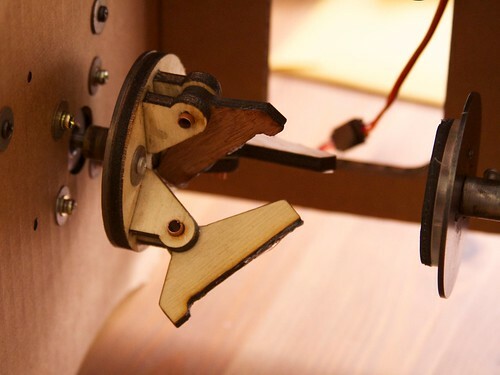 The whole machine is put together from a combination of off the shelf parts and found materials, many of which are laser cut for the correct shape. For software, Don uses the Eggbot Inkscape extensions with very reproducible results. Thanks to Don for bringing it by and letting us take pictures! This entry was posted in Electronics, Engineering, Open Hardware, WaterColorBot and tagged electronics, mugmaker. Bookmark the Permalink. 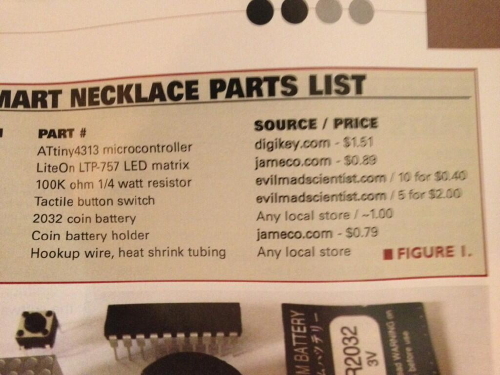 We’re listed as one of the sources for parts for a smart necklace project in the most recent issue of Nuts and Volts magazine. 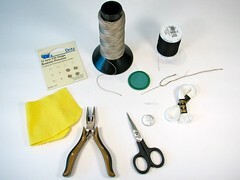 Over in our shop, you can find the resistors and switches mentioned, along with many other useful project components. Thanks to James Sentman for the heads-up and the picture! This entry was posted in Electronics and tagged electronics. Bookmark the Permalink. 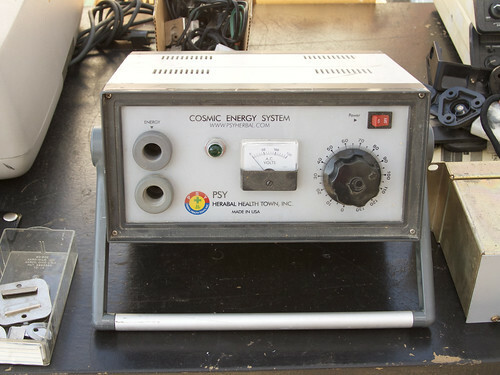 Today was the monthly Electronics Flea Market in Cupertino, and we came across some gems this month. Above, an AN-OIL-IZER. 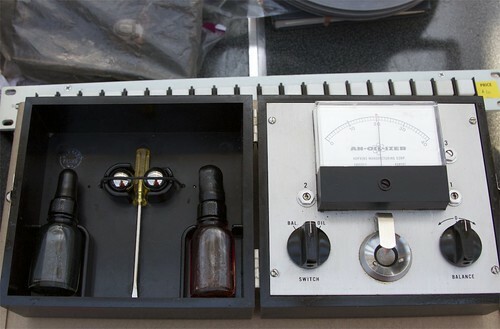 The seller said her geologist father used it for testing oil purity. It’s described in patent number 3182255, a device for capacitively testing lubricating oil (e.g., engine oil) for contaminants, by looking for changes in its dielectric constant. To use it, you place a drop of the oil in the holder, and the ball bearing into that drop of oil. 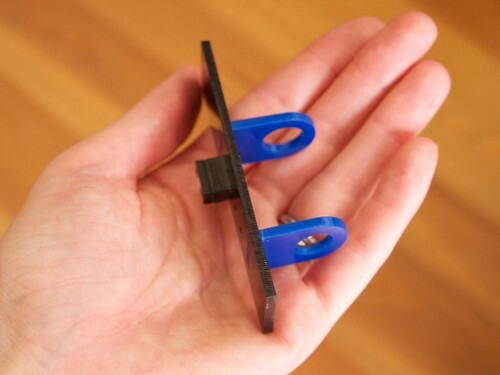 The bearing is held down by a leaf spring, keeping it indexed against the holder. 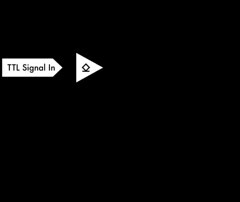 This forms an oil-filled capacitor between the ball bearing and a lower curved plate that is insulated from the bearing. 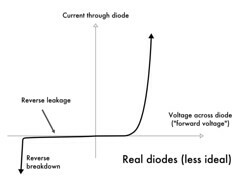 The capacitance will vary as the dielectric constant of the oil changes due to contamination. It comes with two ball bearings, as well as oil samples for calibration. 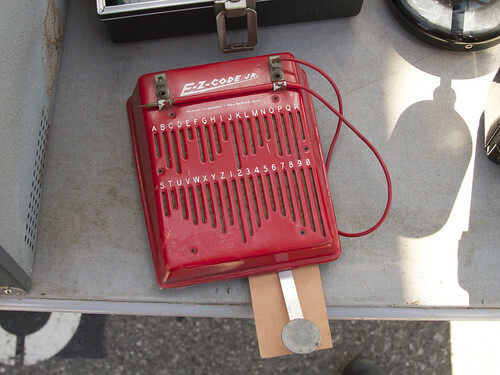 The E-Z-Code Jr. is a tool for learning morse code: when you draw the “electric pencil” through the slots, it crosses contacts in the correct spacing to make the characters. It also has a hinged telegraph key which can be tucked away below the device. 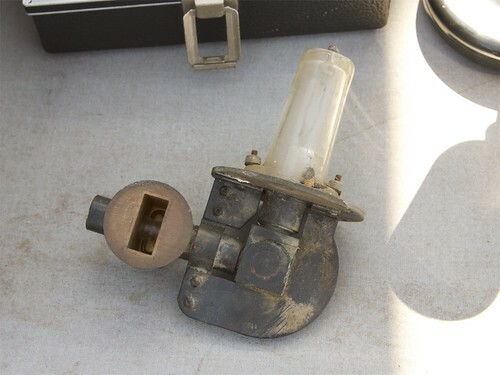 The seller of the E-Z-Code Jr. told me that the thing I really should be photographing was this magnetron. It is a beautiful old piece of hardware, with its wave guide and high-power tube. 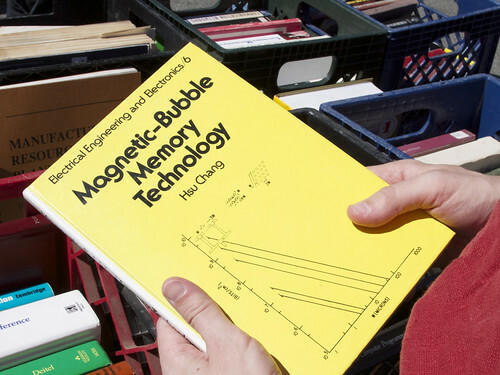 We found a book on Magnetic-Bubble Memory Technology. We also saw a book on tube delay memory. We’re not sure if these are a step up from the single-bit flip-flop memory in our Digi-Comp II. 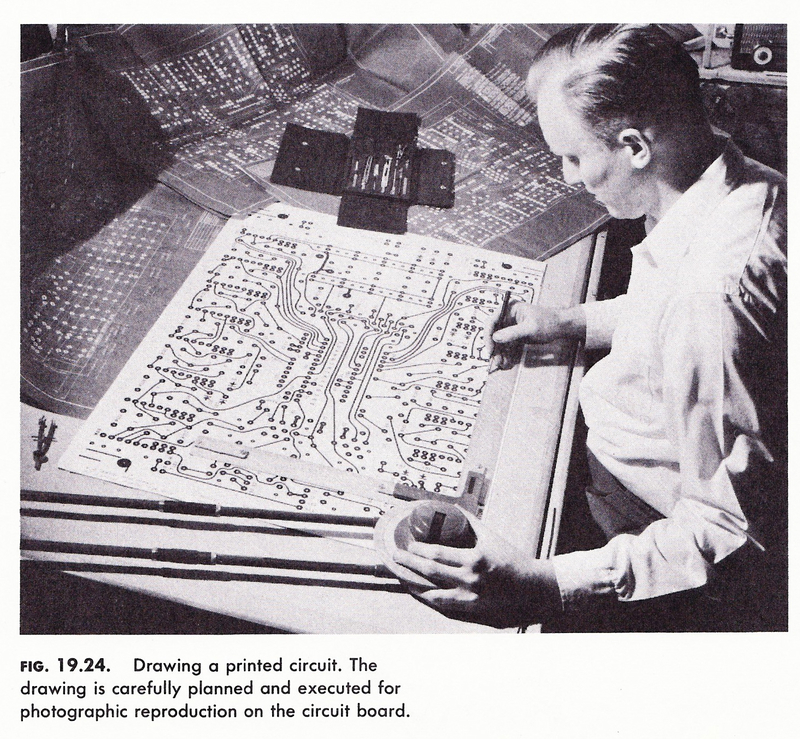 This entry was posted in Electronics, Engineering, Field Trips and tagged electronics, vintage tech. Bookmark the Permalink. 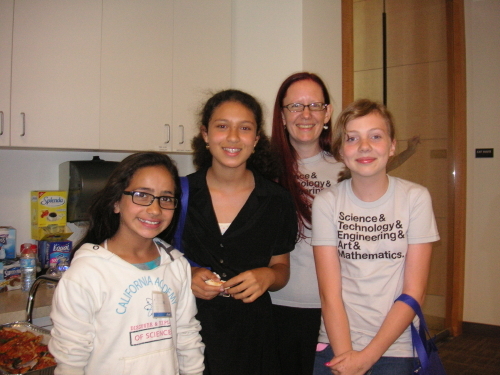 Super Awesome Sylvia and I were invited to attend Bring Your Kids to Work Day at Atmel recently. (Atmel, of course, is the company that makes the microcontrollers found inside Arduino products and in many of our own projects and kits.) We were there to help provide tangible, interesting, and playful examples of how Atmel chips can be used. 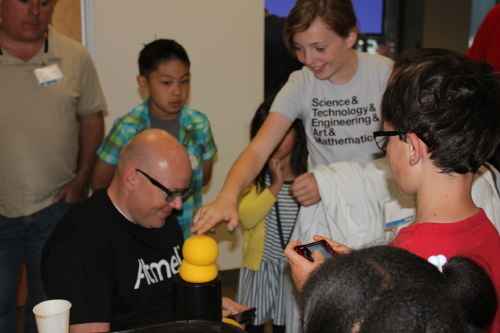 And of course, we weren’t going to miss an opportunity to visit Atmel headquarters! 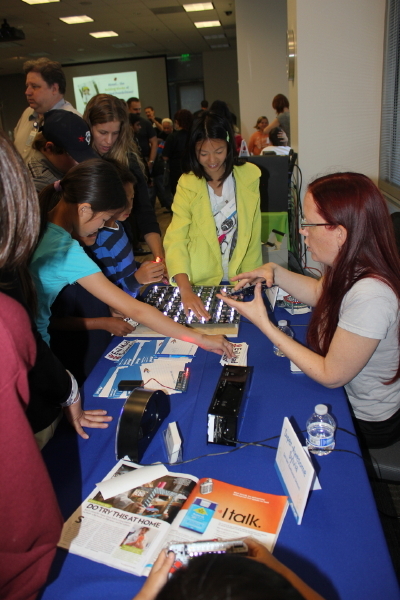 The biggest hit with the kids were the Octolively interactive LED modules (sporting the Atmel ATmega164P). When the kids waved their hands over them, the LEDs would light up and ripple. Some of the kids would start out by poking and grabbing at the LEDs until they lit up, but as soon as I told them it would work “even without touching it” their eyes would get big, and they’d wave their hands over the top, enthralled. Some of the other things we brought were our handheld game, the Meggy Jr RGB (with the ATmega328P); a Bulbdial Clock (Atmega328P again), which points rings of LEDs at different heights down at a central point to create shadow hands of different lengths; our giant Alpha Clock Five (ATMega644A); and the Larson Scanner (ATtiny2313A), which lights up nine red LEDs to make a scanning robot eye. Another project that captured the kids’ attention was a Keepon by BeatBots. 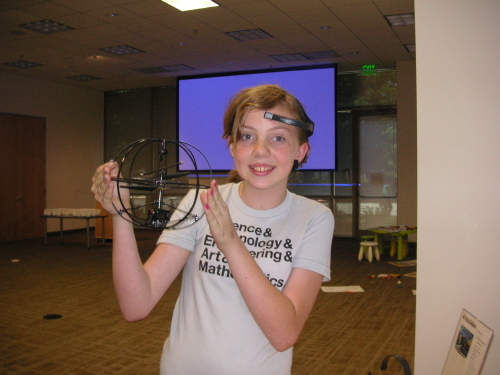 Other demonstrations included a quadcopter and a hacked hexabot. 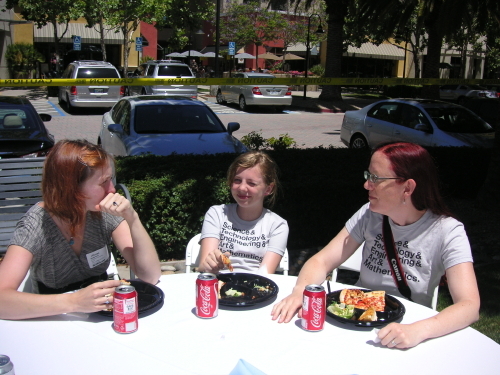 We got to have lunch in the bright sun in the courtyard with Avary Kent, who was demonstrating the PuzzleBox, a brain-controlled helicopter. Sylvia got to give the PuzzleBox a try, triggering it to fly as soon as she concentrated hard enough. After lunch, we got to tour of a couple of labs. This workbench was well stocked with a Metcal soldering iron (our favorite) and lots of tools and supplies. 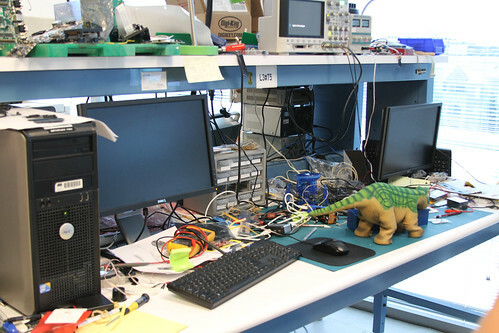 Apparently the poor Pleo on this bench needed some repair. 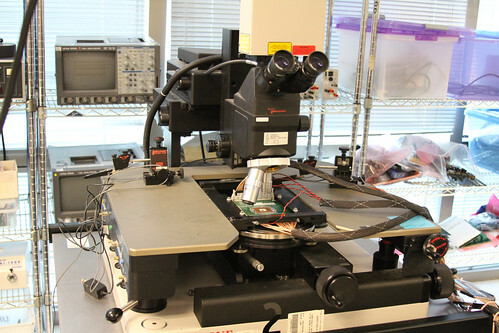 This machine is for inspecting and testing chips after they have been removed from their housing. We got to go into the RF anechoic chamber, and watch as our cell phones stopped receiving any signals. We also had some time to hang out and horse around with friends new and old. 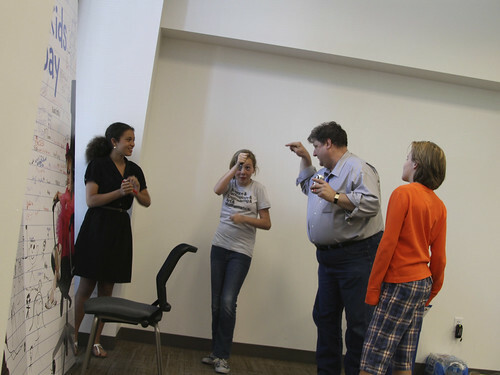 Our friend Paul Rako seemed to be having as much fun as the kids. Thanks to Paul and Atmel for inviting us to visit! This entry was posted in Education, Electronics, Engineering, Field Trips and tagged alpha five clock, atmel, bulbdial clock, electronics, kids, larson scanner, muggy jr. rgb, octolively, super awesome sylvia. Bookmark the Permalink. We found this gem in A Manual of Engineering Drawing for Students and Draftsmen, 9th Ed., by French & Vierck,1960, p. 487. Printed Circuits allow miniaturization and the elimination of circuit errors—advantages that cannot be obtained by other methods. Once a pattern or suitable design is established, preparation of a black and white drawing can start. Scales for reduction, for example, 4 to 1, 3 to 1, or 2 to 1, are used. To insure sufficient bonding area of the metal laminate during soldering operations, lines should not be less than 1/32 inch in width when reduced. 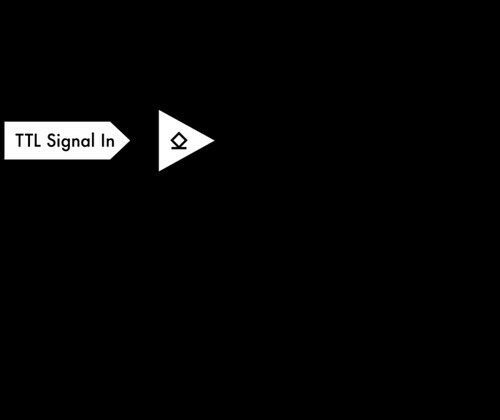 Line separation should never be closer than 1/32 inch on the final circuit. Figure 19.24 illustrates the drawing of printed circuits. This entry was posted in Electronics, Engineering, Vintage Technology and tagged electronics, pcb, vintage tech. Bookmark the Permalink.